Final Cheque For The Boston Marathon UK. 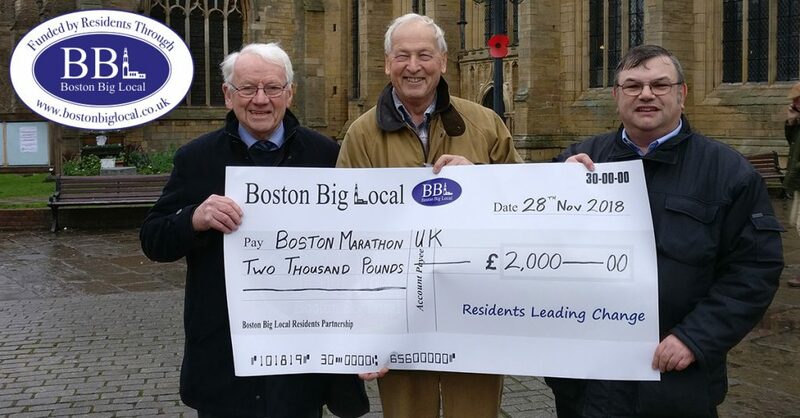 Since the first Boston Marathon, UK was run in 2016, we, the residents of Boston Big Local, have pump funded the event to help get it up and running. Now going into its fourth year the Marathon is heading towards profitability meaning this will be our last investment into this event. On Wednesday the 28th of November we presented our final cheque for £2000 to the Boston Marathon. With Boston Big Local only being around for up to another 5 years means the Boston Marathon, UK has the potential to leave a legacy for us as a group. For that, we are truly grateful to the efficient and capable stewardship of its organising team. This event has year on year, grown in size with its participant numbers increasing and some very exciting plans for the future. We would like to take this opportunity to thank everyone involved in the Boston Marathon, UK for all their hard work in starting and running this event for our town and we wish you all the best for your future endeavours. No Comments to "Final Cheque For The Boston Marathon UK."